Netflix- the culprit behind every late night, or even midday, binge. Like almost every adolescent, I too have participated in the act of binging– pajamas on, junk food on hand, and not one ounce of motivation to get up and be productive. Recently, I binged season two of Netflix’s newest hit, On My Block. 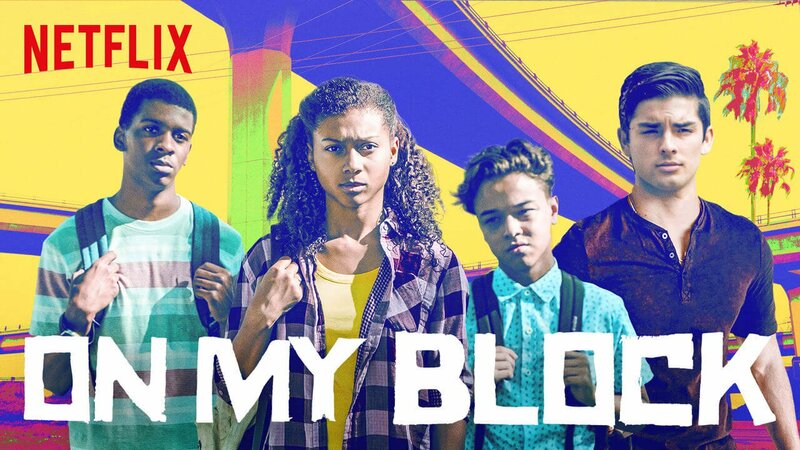 The series follows four friends who have to maneuver through the ups and downs of high school while growing up in the ghetto. Following the explosive finale of season one, I could hardly wait for March 29th to finally come around. After patiently waiting for the red box that reads “New Episodes” to pop up, I was finally able to satiate my newest addiction. I would finally get the answers I had been dying to find out: Did Ruby or Olivia die? What happened with Jamal and the Rollerworld money? Will Cesar and Monse still be together? With questions as huge and looming as those, I was certain season two would be as addictive and enthralling as season one; only to be severely let down. In my opinion, season two was boring and completely outdone by season one. Warning, spoilers are definitely ahead. Following the gut-wrenching quinceanera scene in which Ruby and Olivia are both shot by Latrelle, the viewers are left with the heartbreaking shot of Ruby reaching out towards Olivia, as blood pools beneath them both. After waiting almost 5 months to find out who died, I was disappointed to not only find out that Olivia died– but also at the fact that her death was simply commemorated in the opening shot of season two, and rarely discussed throughout the remainder of the season. Although she wasn’t a part of the four main characters, Olivia undoubtedly played a huge role in season one: Monse’s first actual friend, Cesar’s girlfriend, and Ruby’s first love. The fact that her death was literally only acknowledged in the first episode really confused me, considering her involvement in the plot and the giant cliffhanger at the end of season one. After this, my expectations for season two were instantly lowered, and the disappointment only continued throughout the remaining nine episodes. Jamal’s hunt for the Rollerworld money had viewers jumping for joy when all his hard work paid off– as he dug up $200,000 at the end of season one. All of that money meant endless opportunities for the friends until they ended up unable to actually USE it. Yep, that’s right. For the majority of season two, the Rollerworld money helped absolutely no one– in fact, it actually acted as a burden. And finally, after committing wire fraud to actually make the money spendable, Jamal and Ruby lose the money to Spooky, in an effort to buy Cesar’s protection and allow him to rejoin the Santos gang. All the hard work and dedication that once had me jumping for joy? Gone. Disappointment on the other hand only grew. The only salvation of season two was the undeniable love between Cesar and Monse. Like all hopeless romantics, I couldn’t help but wish for them to be on the screen. Although moments of their relationship were definitely questionable: Monse disappearing for a whole month to live with her absentee mom and Cesar sleeping with another girl, I couldn’t help but root for them in every episode. Following season one, this season of On My Block did not live up to all the hype and my personal anticipation. Although all my questions were answered, they felt incomplete and the season was slow, repetitive, and hard to watch. In comparison to season one, which I finished in a day, I found myself struggling to watch one episode a day of season two. Everything felt predictable, rushed, and forced, with no rhyme or reason to the plot. Season two also left the viewers with a cliffhanger– Cesar, Monse, Jamal, and Ruby all being kidnapped and thrown into a van before it speeds off into the distance. Although there is already talk of a season three, I definitely won’t be marking my calendar with the release date.